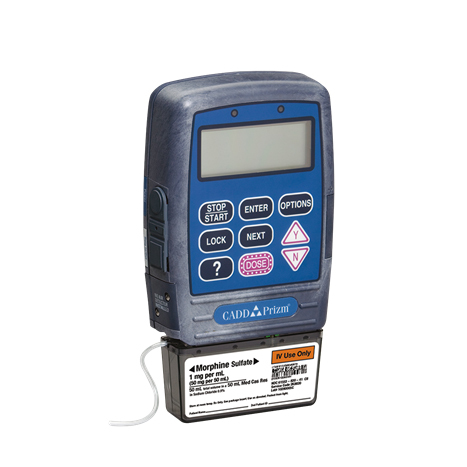 The CADD-Prizm ambulatory drug delivery pump provides measured drug therapy to patients in hospital or outpatient settings. The PCA delivery mode is used for therapies that require a continuous rate of infusion, patient-controlled demand doses, or both, such as patient-controlled analgesia. The continuous delivery mode allows the infusion of drug at a constant, programmed rate. the TPN delivery mode allows the infusion of nutritional solutions or other fluids, with optional tapering at the beginning and end of infusion. The intermittent delivery mode allows the infusion of a specific volume of drug at a regular, programmed interval.